Presencia has the most complete and colorful line of 3-Ply 100% mercerized Egyptian cotton available. All cotton products from Presencia are solid dyed and colorfast. 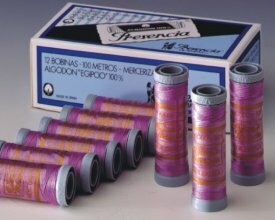 Available in 100m and 500m spools and 3797 yard cones.